Bipolar disorder, also sometimes referred to as manic depression, is a serious psychological disorder. Bipolar disorder is characterized by intense and unusual shifts in mood. Individuals with bipolar disorder experience periods of intense highs in mood where they may feel unusually happy, energetic, or active (known as a manic episode) and intense lows in mood where they feel sad, down, and inactive (known as a depressive episode). Although bipolar disorder was originally thought to only effect adults, recent research has shown that bipolar disorder is moderately common in children and adolescents, with an approximate prevalence rate of about 2%. Manic and depressive episodes in children can look very different than manic and depressive episodes in adults. For example, during a manic episode, children may act in a very silly way, appear extremely joyful without a clear reason, or be very irritable and touchy. Children experiencing a manic episode may also have excessive amounts of energy despite sleeping very little, talk excessively and in a pressured manner, say things that don’t make sense, and have difficulty staying focused. Manic episodes are also at times accompanied by risky behavior. During manic episodes, children and teens can be excessively impulsive and make poor decisions. During depressive episodes, children experience intense sadness, feelings of guilt or worthlessness, and low motivation to engage in activities they usually enjoy. Sleep and eating patterns may also change during depressive episodes and children may sleep and eat either much more or much less than usual. Although some children show signs of sadness during depressive episodes, it is important to know that depression in children can look very different than depression in adults. 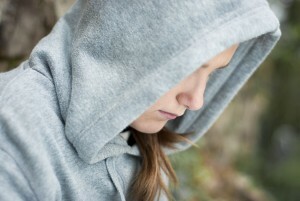 Children who are depressed sometimes do not show signs of sadness. Instead, they may act out more than usual by breaking rules or arguing, appear irritable, or isolate themselves from family and friends. During depressive episodes, it is not uncommon for children and teenagers to experience suicidal thinking. It is very important to take suicidal thoughts in children seriously and to find immediate help from a mental health care professional if your child shows any signs of suicidal thinking. It’s important to remember that all children and adults experience changes in their mood. Bipolar disorder is much more serious than normal changes in mood. Mood shifts in bipolar disorder are very extreme and affect a person’s ability to think clearly, do well in school, or get along with friends and family members. Bipolar disorder is a lifelong illness and symptoms do not just go away on their own. Fortunately, with psychological treatment and medication, children and families can learn how to manage symptoms and live successful lives. Bipolar disorder can have significant negative consequences on children and adolescents who suffer from the condition. Parents and family members of youth with bipolar disorder may also be affected by disorder. Thus, it is extremely important that children with bipolar disorder receive medical treatment. Psychiatric medication is often used in the treatment of bipolar disorder to help stabilize mood, reduce impulsivity, and adjust erratic sleep patterns. Medication management is often times a very important component of treatment for children with bipolar disorder; however, it is important to know that psychological interventions are also very important in helping children and families manage the symptoms of bipolar disorder. Medication alone is usually not enough for a child or adolescent with bipolar disorder. Below a review of evidence-based treatments (treatments that have been shown to work in research trials) is presented. Multi-Family Psychoeducation Psychotherapy (MF-PEP): MF-PEP is a psychotherapy that was developed for children with depressive and bipolar disorder. The intervention combines psychoeducation with family therapy and cognitive-behavioral therapy techniques. Children and families learn what it means to live with bipolar disorder, receive social support from other families, and learn how to manage their symptoms with practical techniques, known as emotion-regulation strategies. Therapists using an MF-PEP model may focus on teaching children how to problem-solve, communicate more effectively, and calm themselves down. Parents also learn the same strategies so they can use them at home with their child. Family-Focused Treatment for Adolescents (FFT-A): FFT is a treatment that was originally developed for adults, but was adapted for children. FFT-A focuses on providing psychoeducation related to bipolar disorder and focuses on communication enhancement training and problem-solving skills. Sessions are conducted with the child, parents, and siblings. Therapists using an FFT model work to help the child and family have the same understanding of symptoms, triggers, and coping skills. FFT also focuses on helping children and families follow their medication regimen, which can sometimes be a challenge for adolescents with bipolar disorder. What to do when symptoms re-emerge (relapse) is also a focus of FFT. Dialectical Behavior Therapy (DBT): DBT is a treatment that was originally developed to help treat adults with Borderline Personality Disorder who were at risk of taking their own lives. Recently, DBT has been shown to help individuals with bipolar disorder as well. DBT involves both children and their parents in treatment. DBT also includes as-needed phone coaching (i.e., access to your therapist outside of session in specific crisis situations to help improve coping skills). Children and families in DBT learn several skills including mindfulness (how to be aware of internal and external events), distress tolerance (how to manage difficult situations), emotion regulation (how to regulate mood), interpersonal effectiveness (positive ways to communicate with others), and walking the middle path skills (how to avoid black and white thinking and compromise). Interpersonal Social Rhythm Therapy for Adolescents (IPSRT-A): IPSRT-A teaches children about the relationship between their social routines and mood. Sessions are usually with the adolescent alone; however, 2-3 family psychoeducation sessions are also held. For certain families, more parental involvement may be included. IPSRT-A focuses on helping families remain adherent with medication, improving interpersonal relationships (for example, helping the adolescent find ways to manage stressful relationships within and outside the family), and creating routines. IPSRT-A uses behavioral strategies to teach children how to keep up their usual social schedules and sleep pattern, which is often a struggle for individuals with bipolar disorder. Fristad, M.A. & MacPherson, H.A. (2014). Evidence-Based Psychosocial Treatment for Child and Adolescent Bipolar Spectrum Disorders. Journal of Clinical Child Adolescent Psychology, 43 (3), 339-335.